Play golf from early spring to late fall at Fernwood Hotel's 18 hole par 71 course. Open to the public, the course offers a variety of challenging holes tucked into the rolling hills of the Pocono Mountains. The course offers professional golf instruction with a PGA certified Pro, a fully stocked golf shop, golf carts and a practice hole. Before or after a round stop at Wintergreens Patio Grill located next to the Golf Shop. Fernwood's Golf Course has been recognized for its well manicured greens thanks to Course Superintendent Jeff Lipics. 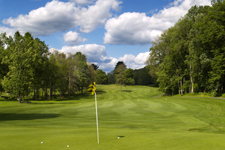 Take on the challenging fairways and greens of the Fernwood Golf Course on your next Pocono Mountains Region of PA golf packages through Genesis. Whether with business associates, golf outings, family or friends, Fernwood provides an exciting golf experience.